Adventure efficiently whilst also maximising the storyline, fun and reward possibilities. BQL also provides essential background lore. It is extensively researched. 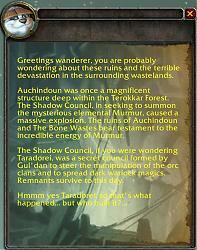 Much of WoW is based upon events occurring in other games, books and comics. BQL does NOT break immersion for RPers. Pick of the Week 12th July 2015! Unique, detailed and accurate. Nothing else like it, anywhere! * Excellent for first time adventurers or those wishing to slow down and savour the lore. Detailed lore for the reassessed Illidan. Also Demon Hunters, Maiev Shadowsong, Tyrande, Malfurion, the Skull of Gul'dan, the Well of Eternity, etc. And yes, Blizzard snuck some of this in as early as patch 4.0.3!!! This AddOn requires the Best Quest "engine" to drive this module. Instal this module like any other AddOn. Use the installer provided by this website if you really must. Whenever updating or installing *any* AddOn you *must* quit WoW completely, relaunch, then enjoy! Tarocalypse has a penchant for noodles and dumplings but this Pandaren is well travelled and wise to the world of Azeroth. "Indeed" Tarocalypse has a few idiosyncrasies you will soon learn to love (or loathe!). 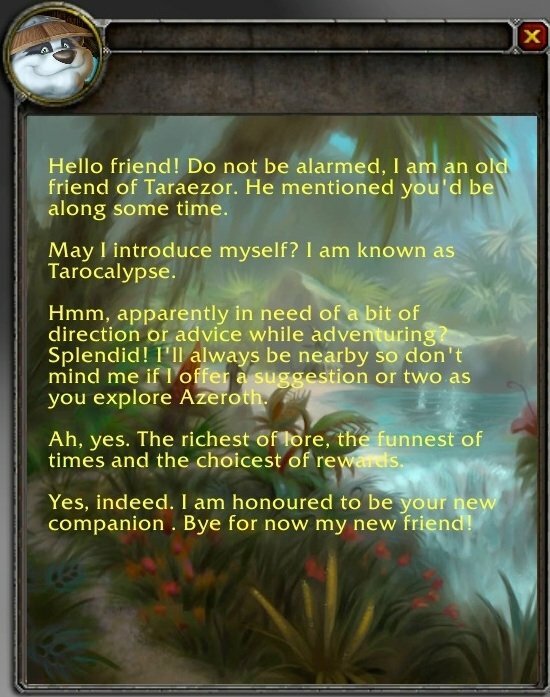 In his own words, he will alert you to "the richest of lore, the funnest of times and the choicest of rewards." Over a currently showing frame, mouse wheel to navigate through past frames. Click mouse wheel (i.e. button 3) to jump to the most recent. Enter "/bq" in chat if no frame currently showing. * NOT intended for players rushing to max level or for those doing The Loremaster achievement and generally doing zones out of order. * Complete from Vanilla through to stepping into Mount Hyjal or Vashj'ir. More to come. * BQL may present several successive frames from the outset, as it catches up to your current situation. Enter /bql lam in chat to hear Sylvanas' hauntingly beautiful dirge, performed only to Horde adventurers. Why not make Best Quest Lore a Favourite and/or use Minion? While adventuring, always take the Best Quest option, use Tip to enhance your Tooltips, pickup a great raptor pet with Adorable Hatchling Nests, and use Hard Yards, the most accurate way to measure distance and get on the Cool Aid, the essential aid to managing your cool downs! Taraezor's main AddOn is We Don't Wipe, an excellent DPS maximiser. It is all about the cookies and beer although, and don't let Gallywix know about this, a "thank you" in the comments section fuels my programming appetite and is very much appreciated. And then, you could cut straight to because as Gallywix would say... "time is money, friend". Go to Tickets as your issue or idea may already have been listed. Please remove your list of AddOns from any bug dumps. Please identify the module(s) you are using. You might prefer to use the forum on this page and allow the author to decide if a ticket is necessary. It is up to you. * 103 - "BotanistcFreywinn" changed to "Botanist Freywinn"
* 277 - "non" changed to "none", "the 100" changed to "100"
* 278 - "library, laboratories" changed to "library and laboratories,"
* 282 - "Donuts" changed to "Dalaran Dougnuts"
* 112 / 113 / 116 / 117 / 242 - Alleria now uses full alpha "1"
* While a player is busy, the engine still allows the module to queue up frames. Better if absolutely nothing happens. * 230 - 238 - rename the saved frame. Fix! * Remove debug code. Doh! * Managed to find a free Java converter PNG->BLP. Tossed the old TGA format files. Now using BLP. 42% smaller! * 77 - The Black Morass. Completely changed the wording. Positive about helping Medivh. The rubbish hinting at lore inconsistencies removed. Pedantic or Purest at best it was. 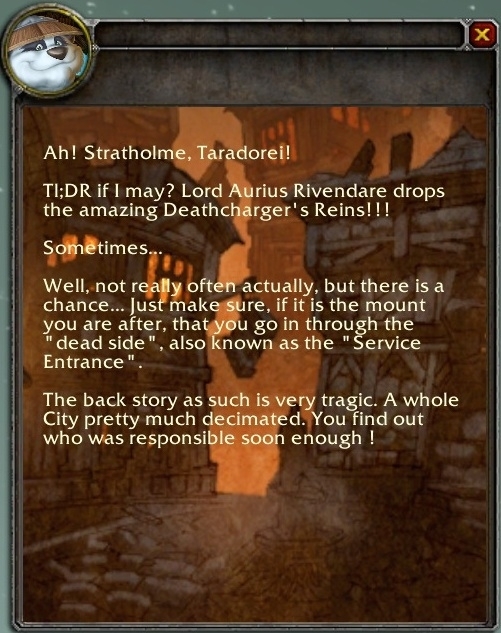 * 127 - Slight rewording of Staat's Pole quest to make text also appropriate for players already pretty much at his location and his name is "Staats", not "Staat"
* 21 - DEHTA suggestion from Zangarmarsh added. 25m delay. * Skinny squish of loading screen graphics fixed. For future ref: W = 0.66583 x H, calibrated against Akama's head on the Outland2 loading screen game file. * Worgen lore extra added. Multiple trigger points. Independent of any existing LE chain. Explains content of worgen starting experience up to "turning"
* Gear and lore advice and info for all worthwhile dungeons. 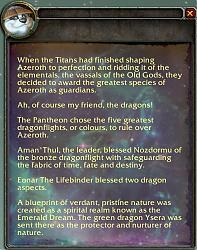 * Dialog #11 (Feralas/WP/DWM choice) now mentions green dragonflight. Had to do this given the green focus in the Legion Expansion. I guess pushing players a little more to do Feralas. * Dialog #18 revamped to boost the Swamp of Sorrows. Green Dragonflight vs Atal'ai / Hakkari trolls etc. * #30 the Sunken Temple completely redone. 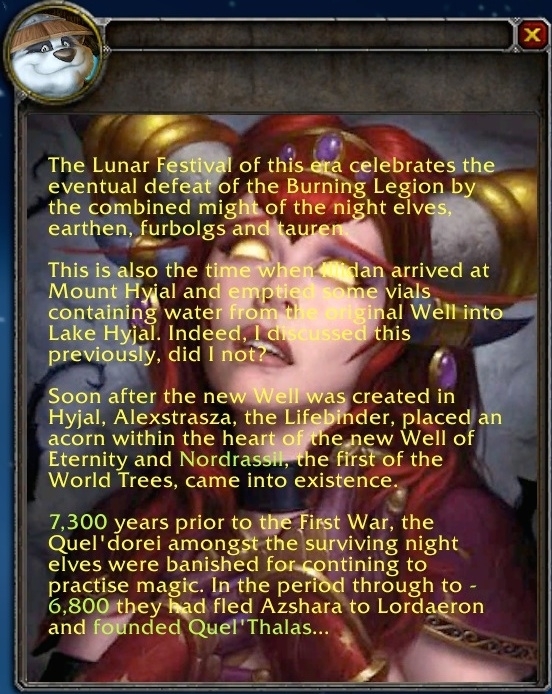 Removed all the negativity about Blizzard emasculating the instance and instead give a summary of the history not really told in the game itself. Added extensive logic to guide the player through the external quest chain. 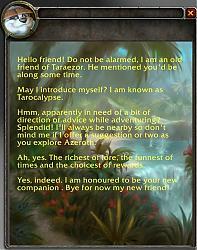 * Added Outland up to and including Terokkar. Introductions to others. Interesting Dungeons done. Mags raid done. * Debug hard code level removed Doh! Just wanted to say that this addon has greatly improved my WoW experience while leveling a character using frequent XP freezes to keep from outleveling any areas before the level scaling change is implemented. I feel pretty bad about this AddOn actually. I haven't maintained it in a long time so I am surprised you could get it to work. Editing the art and researching the lore was a labour of love to be sure. Why stop? Sigh. Retcons yet again by Blizzard. Changes to the way sound files work. Knowledge that removing / minimising strict level requirements would be implemented. The abomination that was WoD with respect to lore. Inconsistencies between source materials which are supposed to be canon. And the retcons again. Sometimes subtle, sometimes full on. I just couldn't possibly keep up. The tipping point was that weird "cosmic map" in the Chronicles Volume I which sought to show the interrelationships between the Void, Light, Dark, Titans, Old Gods, etc. Nice try but oh so very conflicting with pretty much the entire Azeroth mythology. I gave up. But... I will hopefully revisit with a special version for the upcoming Classic. I am busily programming new "classic" AddOns as I write this! A few typos fixed here and there plus some new content. BQL's in game NPC, Tarocalypse, has gone a bit feral. Or at least has had a brain explosion. He has taken it upon himself to explain all that stuff about alternate realities / universes, the Twisting Nether, planes of existence, time travel and all that other stuff we struggle to get our head around. He does actually make sense of it, using quite a good metaphor. Tarocalypse also welcomes you into Vashj'ir and Mount Hyjal and that is pretty much as far as BQL has gotten up to now. The thing about Tarocalypse above is to prepare you for explaining away how we have Main Universe / Alternate Universe and yet some NPCs may seem to cross over between the two. Why did Blizzard feel the need to do this. Sigh. Just putting this out there. If anyone thinks the lore is wrong please post your concerns. If you are not sure where you stand then the cautious approach is okay too - PM me. The timeline was very very carefully researched by me and obviously I have tried to delve into lore that is mostly NOT IN THE GAME. There is no other timeline anywhere on the net which is so comprehensive. 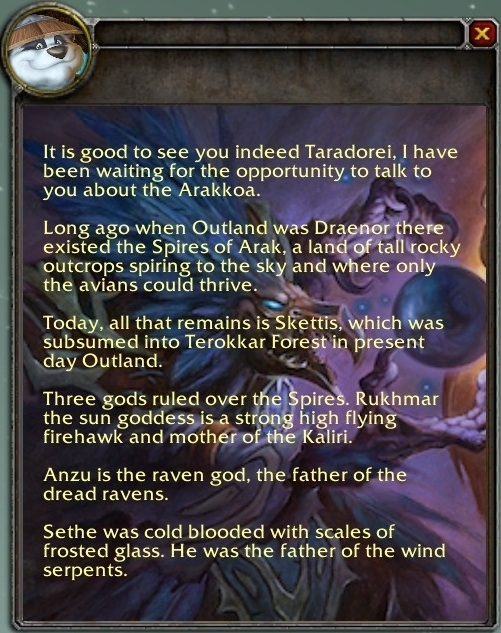 Over time Blizzard have corrected and adjusted ("retconned") lore. And sometimes it just becomes obvious to fans that certain documents considered canon are now quite superseded. Anything that needs to be included - just say please. WARNING: The next release includes an explanation of "different universes", planes of existence, time travel, Twisting Nether, etc. 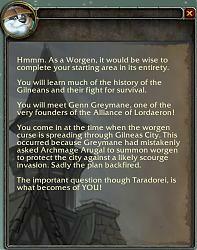 Blizzard have never really tried to tie ALL this together into a COHERENT whole and the positioning of the Draenor in WoD has never really been clarified by them. Thus my attempt must strictly be regarded as speculation. I just got this error when I logged into a toon that I haven't taken anywhere in ages, it sits in Ironforge doing bank stuff. I don't recall the last panel that showed up, or when. I don't log into it often, maybe once a week or so. Many thanks for the report. Didn't see this until after I uploaded v3.08. You are using v3.06. Heck I am hoping it got resolved. v3.07/v3.08 did include a couple of bug fixes, as well as a ton of new content. 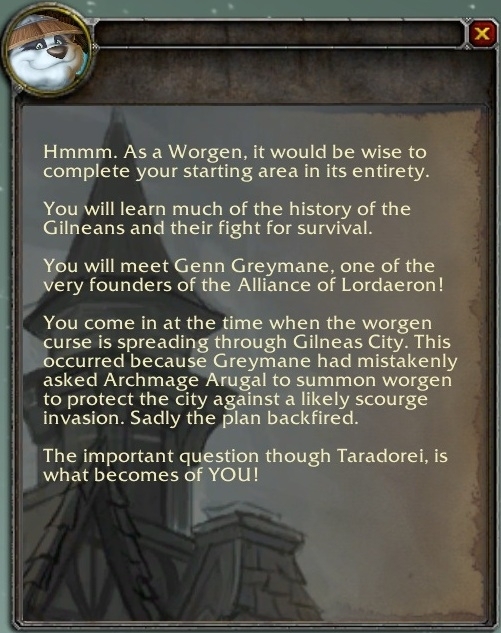 dialogue = "Worgen adventurers will recall being roused by Lord Godfrey, sometime after the worgen invasion of Gilneas City. Life as a worgen, a human who had turned into a lupine form, began at that time. They will remember some of the preceding events but have little knowledge of the significant players in those events. Grab some popcorn my friend, and I'll fetch a dumpling or three or four, and please allow me to enlighten you. It is indeed time, for events soon to unfold will be better understood in the light of what I am about to say..."
dialogue = "Greetings wanderer. Hmmm, indeed ~p~, I do tend to drop by. And sometimes at an inopportune time I know but on occasion lore just cannot wait! But here's a thought. Why don't YOU drop in on me one day? Not saying you have to ~p~. No, no, no my friend. But... I might be able to offer up something extra or interesting if you do happen by. Consider it an OPTIONAL EXTRA, if you will! Lately I have been exploring the whirlpool due south of Lor'Danel in Darkshore. If you are in the area please drop by! Perhaps a hint... A LEGION of heroes are keenly scouring Azeroth in search of early data with regards to a NEW CLASS of hero not yet seen in Azeroth. There may also be a connection to Illidan Stormrage and his jailor Maiev Shadowsong!" DBLabel = "Extra - To the Maw"
(*temporary) = "attempt to perform arithmetic on a boolean value"
1 = "the flight master at 64.3, 42.3. She will facilitate things." 53 = "Welcome, ~p~, to Terokkar Forest! The entire area is rich in lore and rewards. You will not be disappointed ~p~! Indeed, I think it best I give you a quick rundown and then as you explore I will be nearby to offer some help. The Cenarion Thicket, just east of Shattrath, is where you should start. Next, is your base at ~f~. Look for a parrot "Skywing" at 53.8, 72.2 and Oakun at 31.0, 76.4. Lakes Jorune, Ere'Noru, and Blackwind have Highland Mixed Schools from which you can obtain a pet. At Silmyr Lake, Old Man Barlo at 38.7, 12.8 offers fishing tasks with excellent recipe and pet rewards~m~"
43 = "Hmmm hmmm, ~m~. Shadowmoon Valley is steeped in the lore of Illidan Stormrage and Maiev Shadowsong, Akama, and the Black Temple. Obviously some bug fixes and tweaks here and there. Looking at the next major update completing Northrend. Lots of changes to the timing of when frames pop up. Especially the timing of dungeon related frames whilst also in a BG/dungeon/raid/combat etc. Basically, won't happen or will happen on delay or has to happen as outlines the loot in the dungeon, for example. Also, the size of the graphics has markedly decreased as I am now able to use Blizzards preferred format, known as "Warcraft III" format, aka "BLP". Currently I use a secondary acceptable format, "TGA" which saves 32 bits per pixel = massive file size. You try finding a free PNG<->BLP converter for Mac OSX! 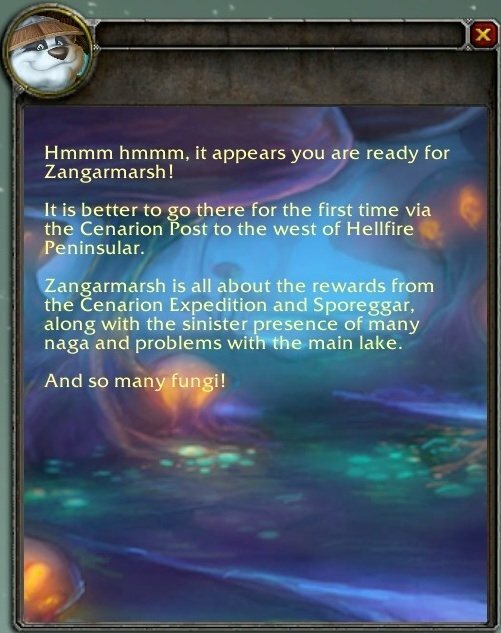 Also timing and wording of the very early level travel advice, such as how to get from Darkshore to Duskwood, has been totally revamped. Plus some new content too. Last edited by Taraezor : 12-09-15 at 05:57 AM. Thanks for the updates. I use Best Quest with Storyline. I think they work well together. Had to edit down lots of frames as I hadn't allowed for really small screen window dimensions. In my opinion unplayable like that but thought I should allow for it nevertheless. PLUS added a ton of new content. As per change log. I noticed after upload that the Feralas changes ended up somehow not being the final version I had worked on. Doh! So currently the text overflows the frame / messy. Upgraded background artwork to all the dialogs really enhances the look of each frame. 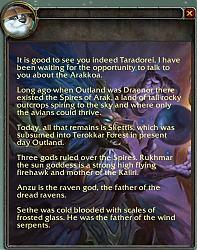 Currently working on Nagrand etc to push through to the start of WotLK ideally, for the next upload. At that stage the plan is to go back and perfect any rough edges of work already done. For example, I didn't mention each zone's three rare spawns in Outland. Some but not all. And advice about good herb/ore/skin farming is patchy. Although that should really be a module all by itself. Hardly to do with "lore". 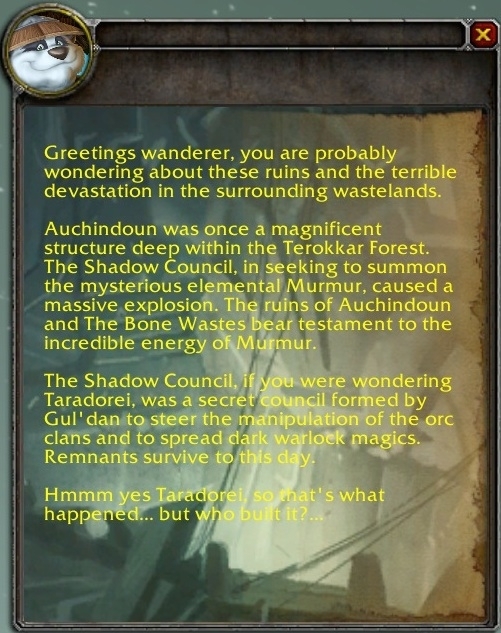 I am aware that a few pockets of lore are missing in Vanilla. The elves in Dire Maul are quite unique. That dwarf area in Southern Barrens has a story to be told. Thunderaan versus Rags needs to be told. Ravenholdt. Taurens need some love. Etc etc etc. Thanks. Yeah, the part of Outland I have done, for example, had only ever been played by me as Horde so I know where you are at there! The author of this addon is my type of player. Thanks for your work! Many thanks. Juggling several things but next up to do is Outlands. This will be a challenge as Outlands, for me, had not much to offer in some zones (Hellfire anyone?) 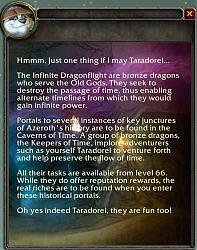 whilst others had a few interesting quest chains (Nagrand Horde quest chain involving Thrall's grandmother etc). Maintaining an office at the Gallywix Pleasure Palace requires me to show the good Trade Prince himself no end of ample "consideration". Sure, he is happy so long as I keep churning out these AddOns and keep them up to date. And bring him a big bag of "consideration" at our regular meetings at the "19th Hole" of his Grenade Golf Course. The problem for me is I program my AddOns for the pure fun and love of programming. So after I have paid off Gallywix, there is little left for cookies and beer. It is all about the cookies and the beer. If you fuel my appetite then I'll fuel yours for more great and up-to-date AddOns!